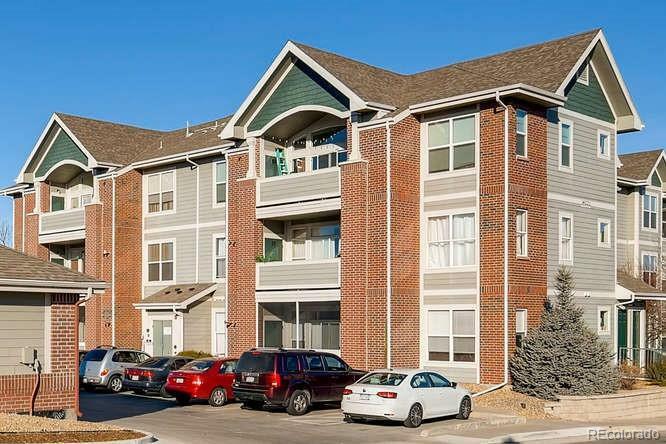 Awesome light and bright 2 bed/2 bath penthouse condo that is very close to to Aurora Town Center and the Abilene Light Rail station. Openkitchen area with lots of counter space and cabinet space as well as eating space and living room with fireplace and balcony. Large mastersuite with walk-in closet and full bath. Hallway office area with built-in desk area. Full size laundry. 2nd bedroom with full bath across thehall. Close to shopping and dining and easy access to I-225. All kitchen appliances and washer/dryer are INCLUDED! Includes a covered balcony and outside storage area off of the patio. This unit also has a detached garage! Carpet to be replaced before closing. You choose the color!